This sign is for Chicago Oil Company. The sign’s colors are white and red. 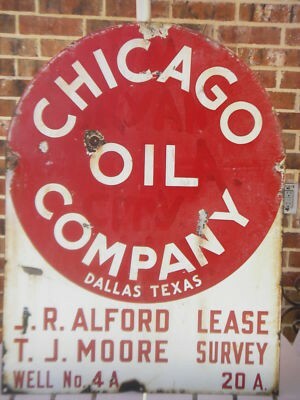 The text on the sign reads: Chicago Oil Company Dallas Texas JR Alford TJ Moore Lease Survey Well No 4A 20A. The sign shows text on a tombstone shaped sign.